1. an acid mucopolysaccharide present in many tissues, especially the liver and lungs, and having potent anticoagulant properties. It also has lipotrophic properties, promoting transfer of fat from blood to the fat depots by activation of the enzyme lipoprotein lipase. 2. a mixture of active principles capable of prolonging blood clotting time, obtained from domestic animals; used in the prophylaxis and treatment of clotting disorders, such as thrombophlebitis, pulmonary embolism, disseminated intravascular coagulation, acute myocardial infarction, or stroke syndrome, and to prevent clotting during extracorporeal circulation, blood transfusion, and blood sampling. 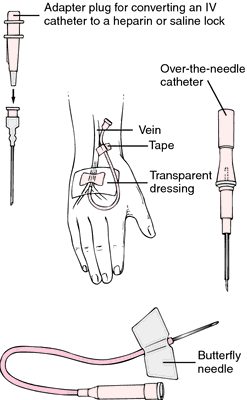 heparin lock a type of intermittent intravenous device for the administration of heparin. It does not require a continuous flow of fluids; the intravenous fluid flow can be disconnected and the heparin lock filled with a heparin solution that maintains patency of the needle. Two types of heparin or saline lock sets. From Lammon et al., 1995. An anticoagulant principle that is a component of various tissues (especially liver and lung) and mast cells in humans and several mammalian species; its principal and active constituent is a glycosaminoglycan composed of d-glucuronic acid and d-glucosamine, both sulfated, in 1,4-α linkage, of molecular weight between 6,000 and 20,000. In conjunction with a serum protein cofactor (the so-called heparin cofactor), heparin acts as an antithrombin and an antiprothrombin. Synthetic preparations are commonly used in therapeutic anticoagulation. It also enhances activity of "clearing factors" (lipoprotein lipases). /hep·a·rin/ (hep´ah-rin) a sulfated glycosaminoglycan of mixed composition, released by mast cells and by blood basophils in many tissues, especially the liver and lungs, and having potent anticoagulant properties. It also has lipotrophic properties, promoting transfer of fat from blood to the fat depots by activation of lipoprotein lipase. It is used as the calcium or sodium salt in the prophylaxis and treatment of disorders in which there is excessive or undesirable clotting and to prevent clotting during extracorporeal circulation, blood transfusion, and blood sampling. An acidic glycosaminoglycan found especially in lung and liver tissue and having the ability to slow the clotting of blood, used as a drug in the treatment of thrombosis. a naturally occurring mucopolysaccharide that acts in the body as an antithrombin factor to prevent intravascular clotting. The substance is produced by basophils and mast cells, which are found in large numbers in the connective tissue surrounding capillaries, particularly in the lungs and liver. In the form of sodium salt, heparin is used therapeutically as an anticoagulant. See also heparin sodium. Hematology A sulfated glycosaminoglycan anticoagulant that inhibits activated factors IXa, Xa, XIa, XIIa and thrombin, ↓ local anti-thrombin-III, promoting its inactivation by neutrophil elastase; interaction of heparin with endothelial cells results in displacement of platelet factor 4, which inactivates heparin Indications Thromboembolism, CAD, post acute MI, PTE Monitoring Titrate heparin so that aPTT is 1.5-2.0-fold normal Side effects Hemorrhage, thrombocytopenia, osteoporosis, skin necrosis, alopecia, hypersensitivity, hypoaldosteronism. See Low-molecular weight heparin. An anticoagulant that is a component of various tissues (especially liver and lung) and mast cells. Its principal active constituent is a glycosaminoglycan composed of d-glucuronic acid and d-glucosamine. In conjunction with a serum protein cofactor (the so-called heparin cofactor), heparin acts as an antithrombin and an antiprothrombin by preventing platelet agglutination and consequent thrombus formation. A complex polysaccharide organic acid found mainly in lung and liver tissue. Heparin is thought to bind to THROMBIN and antithrombin in plasma thereby assisting in their combination and interfering with the cascade of reactions that end in blood clotting (coagulation). From the Greek hepar , the liver. The drug is on the WHO official list. Heparin is widely used as an anticoagulant under brand names such as Calciparine, Canusal, Hepsal, Monoparin and Multiparin. See also LOW MOLECULAR WEIGHT HEPARIN. a mucopolysaccharide molecule produced in the liver and some white blood-cells that acts as an anticoagulant, inhibiting the transformation of prothrombin to thrombin, a vital stage in BLOOD CLOTTING. An organic acid that occurs naturally in the body and prevents blood clots. Heparin is also made synthetically and can be given as a treatment when required. an acid mucopolysaccharide present in many tissues, especially the liver and lungs, and having potent anticoagulant properties. It also has lipotrophic properties, promoting transfer of fat from blood to the fat depots by activation of lipoprotein lipase. Also, a mixture of active principles capable of prolonging blood clotting time, obtained from domestic animals; used in the prophylaxis and treatment of disorders in which there is excessive or undesirable clotting and as a preservative for blood specimens. The patient received heparin flushes via her port every 8 weeks for the previous 11 years with no adverse reactions. The team discovered that heparin stimulates the AgRP neurons located in the hypothalamus, one of the most important appetite-modulating neurons, which results in increased production of AgRP protein, a neuropeptide that stimulates food intake. SPL also received crude heparin directly from consolidators and manufactured Heparin Sodium, USP, at a facility in Wisconsin, which it then sold to Baxter. Elevated levels of thrombin cause the HA to release increased amounts of heparin, and a reduction in the levels has the opposite effect, creating a closed loop system for delivery of the antithrombotic without additional monitoring of dose and maintaining thrombin levels within normal physiological limits. A quasi-experimental prospectively controlled study compared the rate of clotting in chronic HD patients dialysed using the AN69ST heparin-coated membrane and 50% reduced systemic heparin to patients dialysed with a full dose of heparin and a non-heparin-binding membrane. Different patterns of heparin resistance: Therapeutic implications. HIT is an immune mediated reaction to heparin and, even though it is considered as unpredictable, some risk factors have been described. Flushes with heparin or sodium chloride solutions were done every 8hrs. 3 Therefore the cell saver can be used safely idn patients without concerning the residual heparin when properly processed. The use of polybrene to neutralize heparin contamination in blood samples for aPTT was described decades ago when manual methods were relied on. Pharmacists, staff nurses, physicians, nurse educators, and risk managers need to have a heightened awareness of the heparin label changes. Pharmaceutical-grade heparin is prepared from mucosal tissues of slaughtered meat animals such as pig intestine or cow lung (5). China's heparin revisited: what went wrong and has anything changed?